Mischief is a striking looking yacht, with racy lines enhanced by a newly painted French Navy hull and white boot stripe. Her interiors are just as special – the dramatic use of white reflective surfaces accented with blues and blacks gives her a real sense of identity. The spaces are fashion-forward rather than formal, inviting relaxation and enjoyment. Large photographs of stars of the screen, music and fashion add to the relaxed, fun feel. The main salon features a large marble bar, with back-lit mirrored wine and glass racks – a theme found in two further wine stores within the cabins. The upper deck sky lounge is yet another bright white space, with curving glass bays inviting you out to the dining and eating areas on the aft deck. One of the VIP cabins also enjoys this vantage point. The full master suite lies forward on the main deck, with two further large doubles and smaller twins on the lower deck. These twin rooms would be great for children – and with beam all the entertainment on offer they’ll barely spend any time in their cabins – or get up to Mischief! The twin cabins also convert to super kings in the case there may be a full group of adult couples on board. The inflatable slide lets you slip off the bow, then you can climb back up via the over-water climbing wall; or take to the floating pontoons from the stern where you can relax on loungers right on the water, take out a jet ski, seabob or paddle board – or simply let the crew tow you around on an inflatable… Mischief is a bright, lively yacht ideal for a family charter, or a fun time for friends. 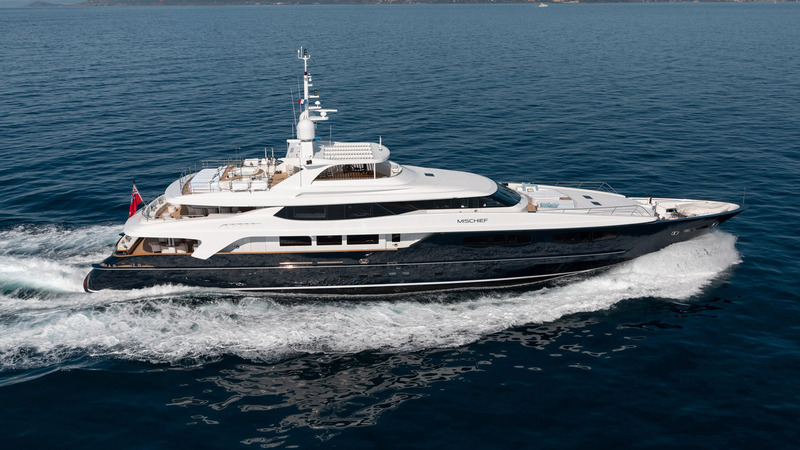 Mischief is a bright, light and stylish superyacht with a cheeky yet sophisticated ambience. Step aboard Mischief and take a 360° tour of her beautiful, comfortable living spaces. Born in the UK, Richard has a strong background in the superyacht industry having worked for many years as a senior account manager at respected media platform Superyachts.com. This invaluable experience has given him an extensive knowledge base about the superyacht industry and exposure to key aspects of the brokerage market including sales, marketing, boat shows, and working with discerning clients. Work at Superyachts.com included the organisation of high profile events and the cultivation of long-term partnerships with industry influencers and clientele, leading to a wide network of contacts within the superyacht industry and complementary luxury sectors. With several sail and powerboat qualifications, Richard also has a good practical understanding of yachting from an operational perspective. Richard joined IYC in March 2017 as Sales & Charter Consultant.